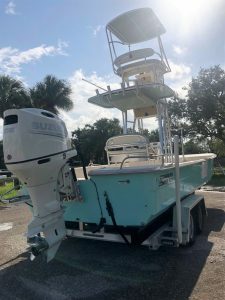 The Sea Turtle Conservancy’s new sea turtle research vessel is ready for service on this project. It was generously funded by private and corporate sponsors. In the race between the tortoise and the hare, the tortoise always wins. In this case, we hope it’s a distant cousin of the tortoise, the sea turtle. 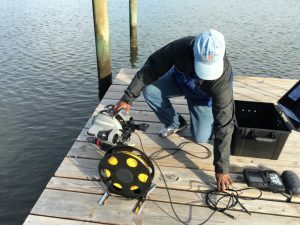 After months of jumping over permit hurdles and putting together key equipment, Dr. Ray Carthy and I are excited to be launching my PhD field research focusing on the green turtles (Chelonia mydas) of the Nature Coast. It’s been a lesson in patience and perseverance. After years of working on sea turtles, it still amazes me how much is required to do research on them. Sea turtle species are listed as endangered and threatened in the U.S. so they receive a great deal of attention, and “official” access to them is tightly controlled. A good example of this is that it took a year and a half to obtain our federal and state permits to work on sea turtles in this part of Florida. In addition to using drones to sight sea turtles, we will also be using this Deep Trekker ROV to video benthic habitat. 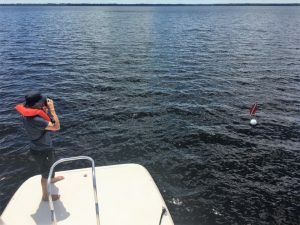 We have been testing various methodologies to measure the distance to sighted turtles and sharks (the dive flag is the “turtle” in this photo). These distances are used in abundance modeling. During that time I’ve worked with colleagues on other sea turtle projects and published a paper on the sea turtles of the Key West National Wildlife Refuge. I’ve also tested new equipment, including Unmanned Aerial Systems, Remotely Operated Vehicles, and, with substantial financial support from the Sea Turtle Conservancy and their partners, a new state-of-the-art sea turtle research vessel. We anticipate that this project will continue past my dissertation work and become a long-term, collaborative research and monitoring effort by UF, STC and NCBS. Now all the testing has ended and the permits are in place, it’s go time! Expect some exciting news coming out of my research over the coming months, starting with a region-wide survey of not just sea turtles, but their arch-enemy, sharks. 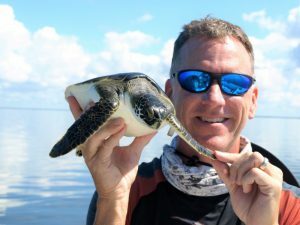 Rick Herren (PhD Student in Wildlife Ecology and Conservation) with a juvenile green turtle captured in 2017 in the St. Martins Marsh Aquatic Preserve. This work was done under Inwater Research Group’s FWC Marine Turtle Permit # 125 and NMFS Permit # 16598.